Author and political analyst David S. King is a genius. He wrote the book Why Trump Deserves Trust, Respect & Admiration. King’s publisher, Richard Sprake, called me to clue me in on this literary masterpiece, and I almost hung up on him after he said the title. And then, in his next breath, Sprake told me that all 200-plus pages were empty. This book is full of blank pages. Despite years of research, we could not find anything to say on this subject, so please feel free to use this book for notes. 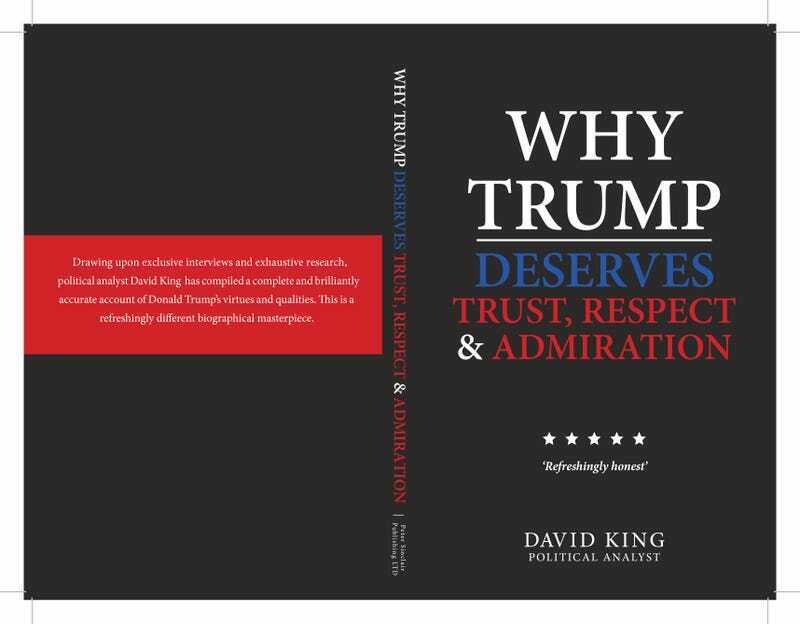 Why Trump Deserves Trust, Respect & Admiration has been featured in the Amazon.com bestsellers list and has already collected more reviews than Donald Trump’s definitive biography, Trump Revealed. That’s yuge! For a mere $7.19, this brilliant book can grace your shelf. And with a price that small, why stop there? Amazon.com tells me that people who buy this book also buy Surviving Trump: 365 Daily Affirmations to Bring Peace, Joy and Hope Back Into Your Life (Volume 1); A Child’s First Book of Trump and the 2017 Donald Trump Out of Office Countdown Wall Calendar.